Visual development is a sub-domain of the Physical Developmental Area! Your baby was born with a 20/400 vision –or the equivalent of being legally blind. But not to worry, your baby’s vision will gradually improve. His vision will actually be one of his main tools for learning by taking in all sorts of information about the world around him. Problems with eyesight can cause developmental delays, so make sure your doctor checks your baby’s progress at every visit. While he can only see out of the periphery in the first few days after birth, your newborn’s not-that-great vision actually serves to protect him from overstimulation. At one month, he will only be able to focus on objects less than 12 inches away! This is about how far the face of the person holding him is, which is mainly what he’ll be interested in anyway. So give him tons of face time, and watch him smile every time he catches a glimpse of your eyes! It is also normal for a baby’s eyes to be crossed the first two months, but eye movements should be coordinated by month three. Other visual skills will be learned in the next few months. Depth perception will develop around the four-month mark, which is part of the reason why it was hard for your baby to coordinate grasping an object or toy before this. He will soon start to get better at tracking moving objects and focusing his eyesight on things that are farther away. Like other skills, vision is learned over time, and certain things can help it develop normally. Although your baby will appreciate high contrast black-and-white patterns in the first few months, you don’t have to limit his exposure to these tones. Contrary to popular belief, babies over two weeks old can actually perceive color, even if their color vision might not be as good as yours yet! Still, black and white patterns will be mesmerizing for your baby, so don’t be surprised if you find him staring at a checkerboard or a bull’s eye. 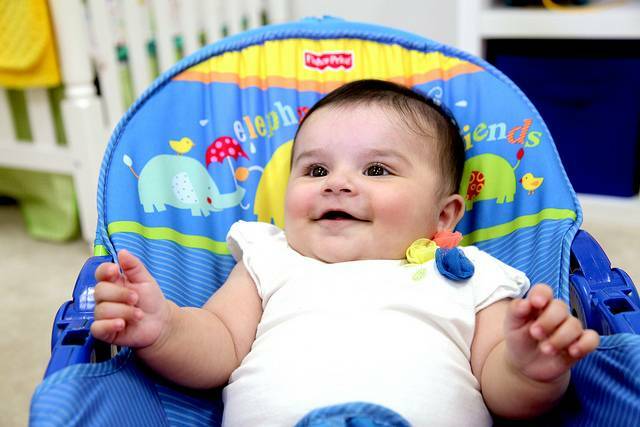 Kinedu has plenty of activities to stimulate your baby’s vision. Here’s one for you to take a look at! Contrary to popular belief, babies over two weeks old can actually perceive color – even if their color vision might not be as good as yours yet! of new stuff proper here! Best of luck for tthe following!